The Catholic Lit Classroom: Socrates or Plato? At a used book sale last spring I came across a book by Virginia professor Mark Edmundson, whose name I recognized from various publications (see here, here, and here). Despite the mawkish title, Teacher: The One Who Made the Difference, hardcovers were only a dollar-fifty, and I took it home. The book was a pleasant surprise, honest, raw, and funny in its recounting of Edmundson’s senior year in high school and Franklin Lears, a young philosophy teacher who, well, made the difference. The setting is Medford, MA in 1969, the teacher in question fresh out of the Ivy League, brilliant, and effete compared to the jocks who filled the class. In many respects the book is a memoir of the divergent worlds of 1960s intellectuals and the working class; in one memorable scene Lears invites the Harvard chapter of the radical Students for a Democratic Society into class to give a lecture. All does not go smoothly. Some of them never show their hand. They always turn the question back on the student. They never declare themselves. This is the way of Socrates, as it is of the expert therapist (Socrates is, among many other things, the first deep analyst of the psyche, the spirit), who functions as a mirror, always showing the patient her own reflection back. But there is another way of proceeding too, and it can be no less transforming. That is to expose oneself fully as a teacher, to be receptive to everything, every resentment, fantasy, affection, and hatred the student brings forward. And once those passions are alive, once they are in play, then let the student use them as energy for intellectual inquiry and thence change. Such teachers are human incandescences—they have ideas, then the ideas have them; they promulgate theories, they burn brilliantly with them, and they are always, always right. They create disciples, smaller versions of themselves. They found schools. Freud was such a teacher. So was Plato. So, in his way, was Jesus. What Socrates wants is rather different. Socrates wants you to know yourself and to become yourself, to pursue the good as it’s in your particular nature to realize it. So Socrates is very reluctant about voicing an opinion. His method is irony, questioning, hanging around, and being annoying. So we can be either Socrates or Plato, he says. The first always turns questions back on the student, plays devil’s advocate in an attempt to get her to recognize the assumptions that underlie their beliefs, the logical consequences that stem from their reasoning. The second type one might recognize in Robin Williams’ Mr. Keating from Dead Poets’ Society. This is the enthusiastic teacher whose very persona spurs student interest in the subject matter (remember, Keating's students only re-form the society after learning that he was once a member). Such a teacher presents himself as one who has been irrevocably altered by the subject matter, in hopes that students, in imitating, will be similarly transformed. These two approaches need not be mutually exclusive. I find myself consciously switching between them, depending on situation. Based on my experience teaching at the secondary level, the Plato identity, when it works, seems to be more appropriate for underclassmen or average-track sections. Often, these students are not yet awake to the possibility that their education can be relevant in a meaningful way, and becoming vulnerable, open to the material and class discussion, is the best chance the teacher has at jumpstarting students’ consideration of the possibility that there might be something worth thinking about in what they’re reading. The Socratic, ironic approach, I find, is better for those who have already begun to display interest in the material. These students respond better to the teacher who operates at a remove from the topic, never displaying his opinion but always, in proper Socratic manner, turning the question back on the student. This rhetorical game often ends, like the Socratic dialogues, in aporia, in perplexity or contradiction, and for it to work, the teacher must let questions hang, often resulting in students being more confused at the end of class than they were at the beginning. Potentially, this approach is more effective, as the burden ultimately falls on the student, not the teacher. After all, in its root meaning, “education” means a drawing-out from the student what is already within. A good teacher learns quickly that she must be an actor, wearing different masks for different situations. At the beginning of the school year, when we can still set the direction for our classes, there's no better time to consider which masks we will take on. 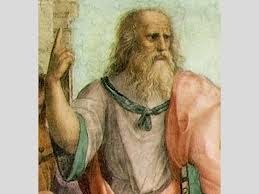 Will we choose Socrates or Plato? Must we choose between them? I would love to hear others’ thoughts.